As some of you may know, Stan Matthews recently retired, so he's no longer the County public spokesperson. A reader sent me the video below purporting to show the new County spokesperson providing the official County response to the ongoing controversy over the Portland Fair situation. I also was sent a related video purporting to show Mike Thomas and his wife being interviewed about their involvement in that controversy. We’ve been reviewing the statistical and demographic train wreck that is San Juan County, but we want to pause for a moment to update everyone on some current events. During public comment at the County Council meeting last Monday (June 8), some citizens finally brought to light a situation regarding wetlands that has been brewing for some time. We’ve been following this story quietly, letting events unfold. Now it’s time to summarize some of the salient points and let the general citizenry evaluate this situation for themselves. It’s a controversy involving wetlands … specifically some purported wetlands on San Juan Island in a development called Portland Fair. Now, before we get into the details of this story, we have to first state that we, at the Trojan Heron, have a particular point of view about “wetland science” and “wetland scientists”. Namely, if you were to send 5 wetland scientists out to an identical property, you are likely to get 10 different opinions about the presence of wetlands on that property. No matter how much mumbo jumbo may be spouted about the integrity of wetland science, the only repeatable aspect of this “science” is its non-repeatability. We’ve seen this time and again. For example, Adamus insisted his methods were essentially 100% correct regarding the presence and location of wetlands in the county, but we’ve seen numerous instances where the official county wetland consultant (Scott Rozenbaum) has disagreed with Adamus’ work, and so on. It invariably occurs that every wetland scientist is absolutely convinced about the veracity of his or her wetland determination for a particular property, but with inevitable regularity, that determination differs violently from that of every other wetland scientist who evaluates that same property. We won’t go into why that happens here … just suffice to say that such occurrences are a basic fact of life in the confusing wetland world, and it plays out in the story we are about to relate. Our story begins with Sheryl Albritton. Albritton is a resident of San Juan Island, and she also happens to serve professionally as a critical area consultant. She was interested in buying a piece of property adjacent to her home. After performing due diligence on the property, including discussing wetland issues with the County (Annie Matsumoto-Grah), Albritton and her husband declined to purchase the property because they felt the parcel was too heavily impacted by critical areas issues, specifically wetlands. Subsequently, another couple purchased the land, and Albritton soon noticed that the property was being developed in ways that she understood to be illegal. Albritton filed a complaint with the Washington Department of Ecology regarding the filling of wetlands on the subject property. Albritton also objected about San Juan County staff being overruled by management when they tried to perform wetland reconnaissance for the subject property, as per the San Juan County Code. 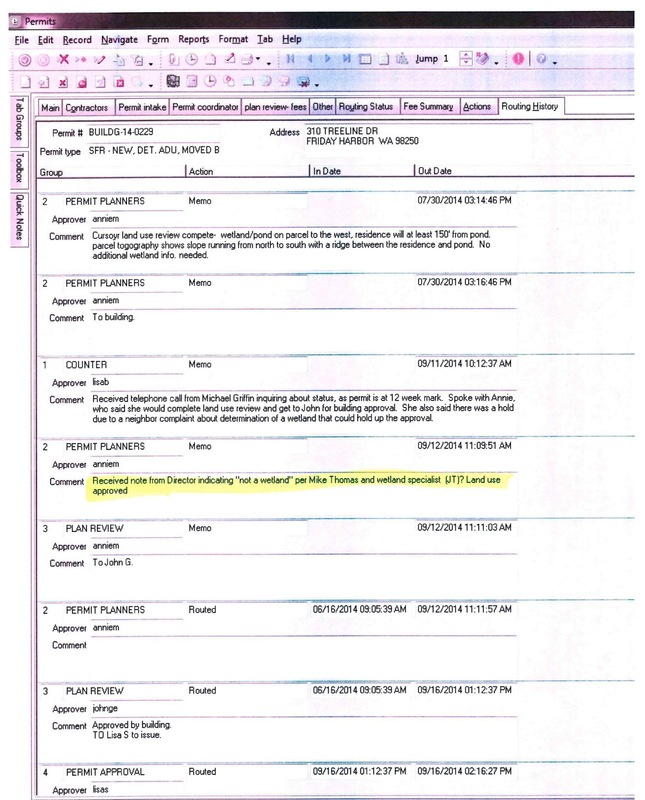 When the Washington Department of Ecology receives a complaint like Albritton’s, they fill out an Environmental Report Tracking System (ERTS) form and notify the local Code Enforcement Officer, who in our case is Chris Laws. Laws received the ERTS complaint for this situation, and he then had the responsibility to conduct an investigation, assisted by Ecology as appropriate. Laws’ investigation found that County employee Annie Matusumoto-Grah had previously provided written information to Albritton saying that the subject parcel was potentially heavily impacted by possible wetlands; however, the new owners nonetheless had received County approval for their development from Annie Matusumoto-Grah … but Matsumoto-Grah’s approval came at the specific direction of Sam Gibboney, head of DCD, who stated that County Manager Mike Thomas walked the site with “local wetland expert JT” and found no signs of any wetlands. The “JT” evaluation circumvented the “normal” wetland ordeal that would typically afflict any other property owner in a similar situation. Matusmoto-Grah had requested from Gibboney the identification of the mysterious “wetland expert JT” and his/her qualifications, but Gibboney refused to provide any information. Matsumoto-Grah nonetheless documented the situation as best she could in the county permitting database. As Laws' investigation went on to discover, the new owners of the subject parcel had asked their local councilman for some “help” with their development project. This councilman, in turn, went to County Manager Mike Thomas to ask for a favor for his neighbor/constituent. While Mike Thomas has no expertise in wetlands that we know of (he’s a planner by background), his wife, Jennifer, is a wetland scientist. In fact, some of Jennifer Thomas’ work can be found in San Juan County's CAO Best Available Science on wetlands. Jennifer Thomas, as it turns out, is “JT”. Jennifer Thomas’ drive-by and walk-through property inspection superseded the formal wetland reconnaissance required by the CAO County code. Apparently, wetland science includes the protocol that when (through your connections) you can get the right bureaucrats to say there isn’t a wetland on your property, you can avoid all the onerous requirements of the CAO ... while everyone else is thrown to the wolves. In case you are keeping score regarding the opinions of the professional wetland scientists associated with this property, here’s the tally so far: Adamus thought there were wetlands on the subject property (hence the original advice by Annie Matsumoto-Grah), Sheryl Albritton thought there were wetlands. Jennifer Thomas (whose work is in the County BAS blessed by Adamus) didn’t think there were any signs of wetlands. But wait … there’s more … while Laws was conducting his background investigation, Professional Wetland Scientist Doug Gresham of Ecology was undertaking his own evaluation in parallel. Gresham visited the subject property to conduct his own wetlands review, and he determined that there wasn’t just one wetland present, but three. Okay … those are the “facts” … and then the alleged cover up began. The details are sketchy, but based on information pulled together from various sources; this is what appears to have happened since then. Laws asked Ecology to formalize their 3-wetland finding in a report so he could place it in the enforcement file. A couple of days after agreeing to Laws’ request, Gresham of Ecology called Laws to tell him that he could not finalize his report because he was told by his superiors (the notorious Erik Stockdale) not to finalize it … because of political pressure. Matsumoto-Grah, who had documented in an office memo the coercion and interference of Mike Thomas and the refusal of Gibboney to provide any information about “JT”, was then instructed to re-write her official statement to exclude any references as to how she felt about the involvement of Mike Thomas or Gibboney vis-a-vis normal staff procedure related to wetlands. Based on the information gathered during his initial investigation, Laws filed a “whistleblower” complaint against Mike Thomas with Prosecuting Attorney Randall Gaylord for Improper Governmental Action (IGA). Reportedly, Laws has been the subject of harassment and intimidation within the County ever since. 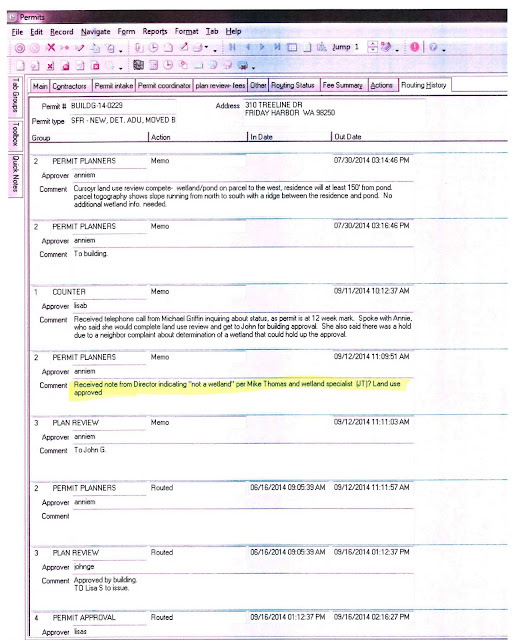 The SJC permit database documents the involvement of JT (Jennifer Thomas) in securing the permit.